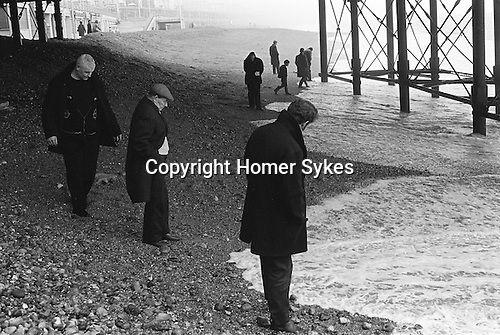 A group of men are Blacksanding under the pier. William Henry Smallman (left) was known as Harry by most or Sailor by closer friends. He waits for coins that have tumbled out of a ‘one armed bandit’, or have been dropped, perhaps fallen from a pocket and though the slatted wooden pier flooring to be washed up with that Sunday morning’s incoming tide. Thanks to his son Rick Smallman Port Macquarie Australia, who writes that he still has a small collection of the coins that his father found.